$699 Seen a lower price? 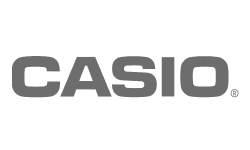 The world-renowned Privia family of digital pianos grows with the Casio PX-770, designed to provide a true grand piano experience in a slim, modern design. 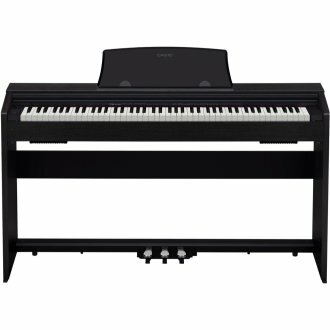 With authentic piano sound, natural feel and impressive features, the PX-770 is a brilliant instrument for inspiring brilliant performances. 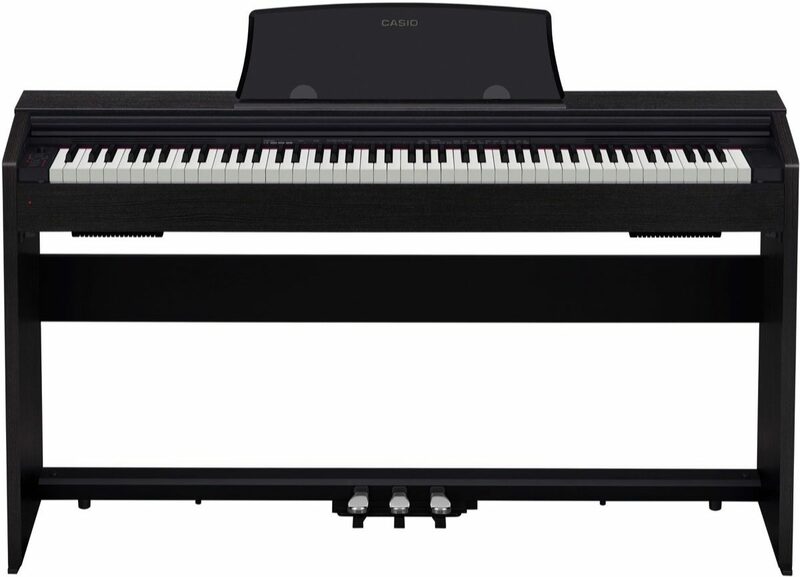 The PX-770's award-winning AiR Sound Source includes a beautiful new stereo grand piano which comes alive with realistic damper resonance, simulating the entire body of the instrument, not just the strings. In addition to the new piano, the PX-770 features a variety of 19 instrument Tones, with the ability to layer and split them as needed. The acclaimed Tri-Sensor II Scaled Hammer Action piano keys give you the expression your performance deserves. The simulated ebony and ivory textures give you an authentic and comfortable touch, combined with an innovative hammer action that is accurately scaled across the entire key range. Adjustable touch sensitivity allows customization to suit any playing style, and adjustable hammer response accurately reproduces the delay between when the key is struck and a note is produced. The PX-770 includes a powerful stereo amplification system. The speakers are conveniently located for an optimal listening experience, and are crystal-clear across the entire audio spectrum. The PX-770's convenient features are useful at home, in a lesson studio, or anywhere else. You can connect two sets of headphones using the 1/4" jacks on the front panel, making the PX-770 ideal for quiet practice. Duet Mode splits the piano into two equal pitch ranges, allowing a student and teacher to sit at the same instrument. 60 songs are included in the built-in Music Library, with room for ten additional songs of your choice. You can also record your performances using the PX-770's two-track MIDI recorder. Designed to compliment any decor, the PX-770 is available in either a black, oak, or white finish. Its compact, elegant cabinet with sliding key cover adds to the beauty of any room. The PX-770 connects via class-compliant USB to any PC, Mac, iOS, or Android device, with no drivers or installations needed.